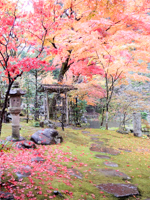 There are several places around Nagoya where you can enjoy autumn colors (fall foliage) of Japan. Some are close to Nagoya, some are not so. Please contact us so we can make recommendation for your particular needs and preferences. 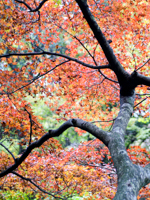 Many people mention Korankei Valley as the best place to see autumn colors. It is true but there are too many visitors on especially weekends, which causes heavy traffic jam. Also Korankei is not easily accessible by public transport and visiting there can be expensive because of the necessity to hire a car. So we do not recommend to visit Korankei. Instead, we recommend following places. Most of these places are approachable by public transport, which can avoid heavy traffic jam in this season. There are many other places so please contact us. Unlike other places on this page, autumn colors start in October around the mountain summit because of the high altitude. 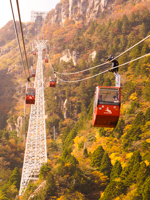 In autumn nearby Jakkoin Temple and its access road are adored with beautiful autumn colors. The legendary "Yoro-no-taki Fall" is famous for its changing colors in autumn. Yellow, orange, red, brown with various tones entertaine you. The town of Gujo Hachiman is well known for the Gujo Odori dance performance. 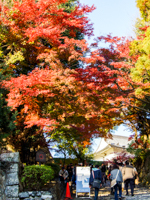 Since Gujo Hachiman is a mountain Town, its castle mountain, streets and temples are adorned with autumn colors in November. Takayama and Shirakawa-go are deep in the mountains. On the way around, you can enjoy autumn colors. If you have a full day around Nagoya, and if you like to visit an authentic old castle, then Hikone Castle is the most recommended place. 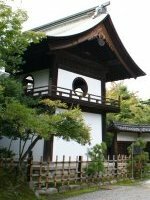 Hikone Castle is on the mountain, and there is a beautiful centuries-old Japanese garden with in the compound of the castle. 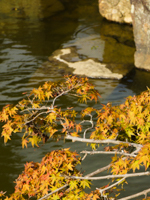 There are other places famous for autumn colors in Shiga Prefecture.